CME: This issue includes 4 AMA PRA Category 1 Credits™; 4 ACEP Category I credits; 4 AAFP Prescribed credits; and 4 AOA Category 2 A or 2B CME credits. Included as part of the 4 credits, this CME activity is eligible for 2 Pharmacology CME credits, subject to your state and institutional approval. 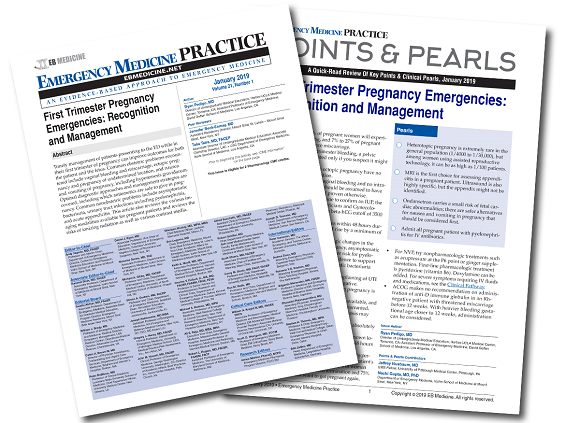 Timely management of patients presenting to the ED while in their first trimester of pregnancy can improve outcomes for both the patient and the fetus. Common obstetric problems encountered include vaginal bleeding and miscarriage, ectopic pregnancy and pregnancy of undetermined location, and nausea and vomiting of pregnancy, including hyperemesis gravidarum. 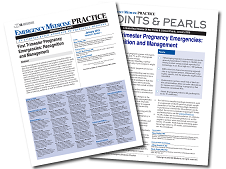 Optimal diagnostic approaches and management strategies are covered, including which antiemetics are safe to give in pregnancy. Common nonobstetric problems include asymptomatic bacteriuria, urinary tract infections including pyelonephritis, and acute appendicitis. This article also reviews the various imaging modalities available for pregnant patients and reviews the risks of ionizing radiation as well as various contrast media.